There's something formulaic about starting a film by showing a slew of archival news clips showing various right-wing pundits, the likes of Rush Limbaugh, claiming that science surrounding climate change is preposterous and pure hokum. This sort of posturing inevitably leads to an onslaught of expert testimony to prove the case, showing an abundance of fancy diagrams and cool animations, blended with dialogue that will make the naysayers sound like morons. Jeff Orlowski's Chasing Ice differs from the status quo of eco-documentary format by providing viewers with tangible visual evidence that is impossible to refute logically. 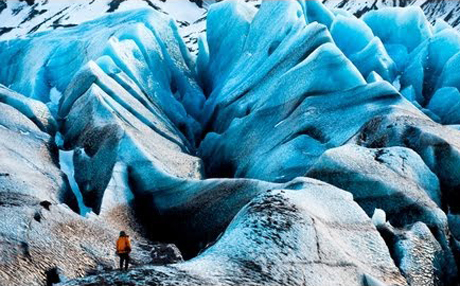 Structured around James Balog's Extreme Ice Survey, a comprehensive multi-year photographic study of the world's glaciers, Orlowski follows the team as they travel to Greenland, Iceland and Alaska to set up a series of cameras that will capture glacial retreat over the span of months and years. The resulting time-lapse photos produce shocking evidence that shows glaciers are melting at an alarming pace, especially when superimposed images, such as a 3D map of Manhattan, are placed over the images to provide a sense of scale and magnitude to the issue. Obviously, the documentary is politically charged, containing the usual suspect appearances of experts that provide additional insight on a problem that has been reported countless times before. But what sets this film apart is the breathtaking cinematography used to bring the point close to home, revealing firsthand footage of glaciers breaking apart and melting before your eyes. Hearing statistics and numbers is one thing but witnessing definitive photographic evidence of receding glaciers is quite another.